iPad 3 was introduced by Apple on Mar 7, 2012, featuring a 2048×1536 double density Retina Display, a faster Apple A5X chipset and 4G LTE connectivity. The retina display with the high resolution of 2048x1536 pixels is going to be one of the top reasons to grab iPad 3, which delivers four times the number of pixels of iPad 2, making web pages, text, images and video look incredibly sharp and realistic. The 3.1 million pixels in the Retina display are more than one million more pixels than an HD TV, and with 44 percent increased color saturation the new iPad displays colors that are unbelievably richer, deeper and more vivid. With handsome iPad 3 in your hand and your pocket on the go, you may want to play video stored on your PC & Mac via it. Generally, you should make sure that the video is in the iPad 3 supported formats before you sync it. What if the video is not readable by your iPad 3? You have to convert video to iPad 3 compatible format like MP4, H.264. Wouldn't it be nicer if you could simply stream video to iPad 3 from your PC or Mac and have it play back instantly? Thankfully, a free iPad 3 video streaming software called Air Playit can accomplish this handy trick seamlessly. It allows streaming video to iPad 3 and other iPad models (Pro/Air/Mini etc.) over WiFi and 3G/4G network, supporting 320 different video & audio codecs (including DRM-protected video) which make it powerful enough to play almost all videos regardless of the formats. Videos even in incompatible formats such as MKV, M2TS, AVCHD, AVI, WMV can be played on iPad smoothly and instantly. Air Playit comprises two parts – server software and app client. The former part is to dwell at your computer, while the latter one needs to be downloaded in your iPad 3 as an App connected to the server so that you can browse and play the videos both locally and remotely. Besides, this free video streaming software for iPad 3 supports both Windows (10) and Mac OS. 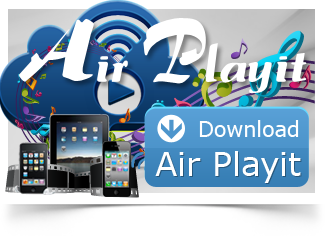 Download Air Playit server on your computer according to the operating system (Windows or Mac), download Air Playit client on the iPad 3. 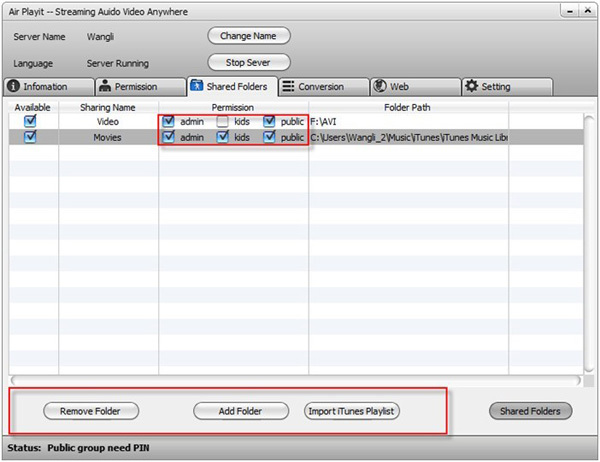 Step one: Run Air Playit Server, click "Shared folders" and add your video/audio by clicking "Add Folder" so that you can stream video to iPad 3 via Air Playit server. You can also choose "Add iTunes Playlist" to build your own personalized audio/video library. Set the permission for watching videos on the new iPad as admin, kids or public. Step Two: Run Air Playit Client on iPad 3. Air Playit does fairly a good job in detecting local network by Bonjour Server, and you will see the following interface; it also provides manual IP address specifying. Click "+" button on the top to specify server address manually. Step Three: After entering the useable server, access the audio video folder you added, choose any audio video file you are interested in, and play it instantly. 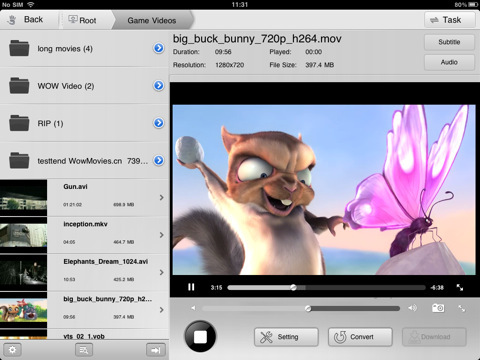 This iPad 3 video streaming app is also capable of streaming video to iPhone, iPod Touch, etc. The iPhone and iPod clients are available in iTunes Store. Disney movies are always attractive. It is amazing if we can watch Disney protected DVD movies on iDevice. But actually, it is possible! We are capable of streaming Disney protected DVD to iPad iPhone through Air Playit and WinX DVD Ripper Platinum for instant playing.